Delaware River Waterfront Corporation (DRWC ) along with Mayor Nutter recently opened the new Race Street Pier, the first new public space of its kind on the Central Delaware River Waterfront to be realized as part of DRWC’s ambitious new Master Plan for the Central Delaware River Waterfront. 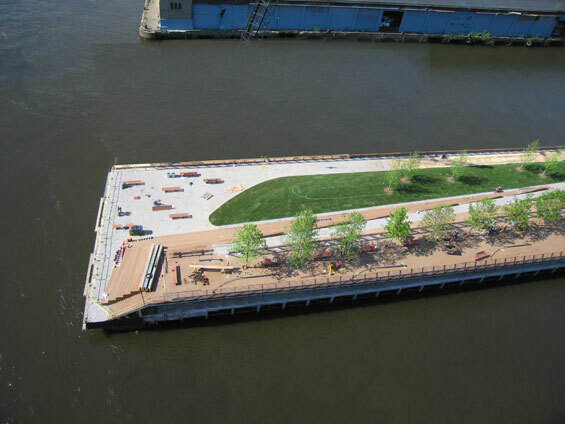 The Pier was designed to create a strong physical experience that reconnects the City to the River, activates the water’s edge and establishes the pier as a distinctive new public park for the people of Philadelphia. 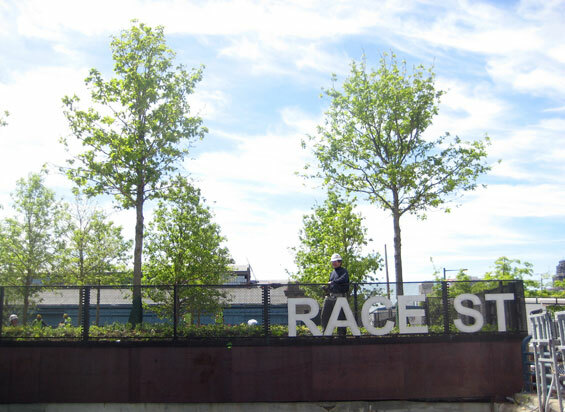 Formerly Municipal Pier 11, the pier was renamed as the Race Street Pier to further reinforce its relationship to the City and reinstate its historic name. In 2009, DRWC Planning Committee awarded the contract for the Race Street project design to James Corner Field Operations. 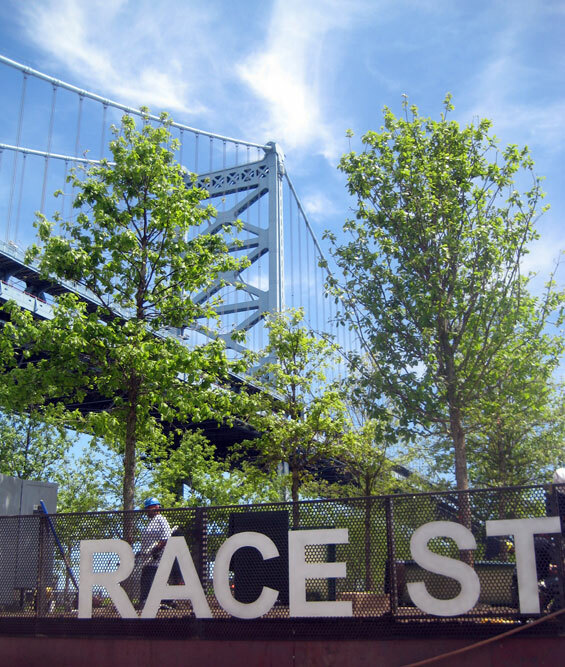 The development of a public space such as the Race Street Pier was an early action recommendation of the Civic Vision for the Central Delaware, an extensive public study conducted by Penn Praxis to re-envision Philadelphia’s Waterfront. “Construction of the original Race Street Pier began in 1896 including a large building built on two levels to serve different functions; the lower level for shipping and the upper level for recreation. As a nod to its past, the physical design of the new pier is split into two levels – an upper level with a grand sky promenade and a lower level for passive recreation and social gathering. 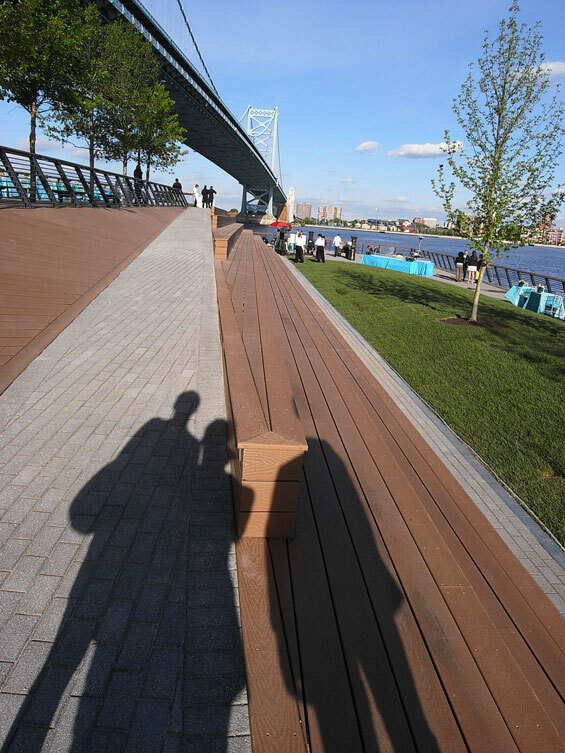 A dramatic ramp rises twelve feet into the air along the north face of the Benjamin Franklin Bridge, dramatizing the sense of arriving in the space of the river through a forced one-point perspective and allowing for rare views back to the City. A sun-filled lower terrace supports a multi-purpose lawn, planting beds and seating. The two levels are linked by a generous seating terrace that wraps around the end of the pier and amplifies the sense of magic associated with being on the edge. 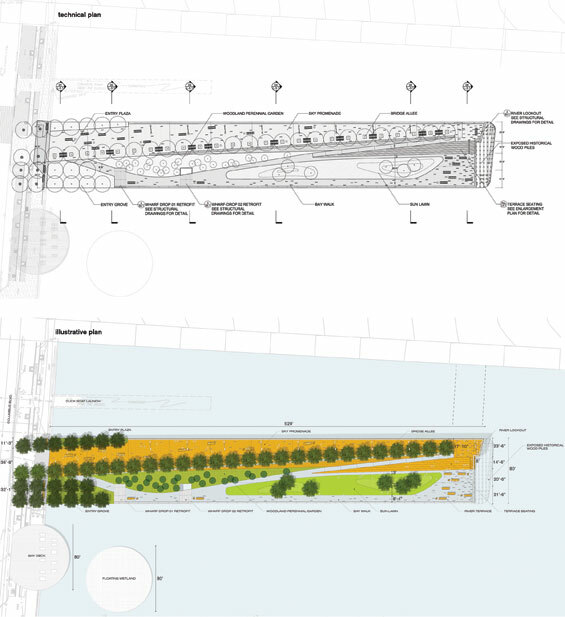 The Race Street Pier will be an integral part of a series of open space improvements proposed every half mile along the central Delaware as part of the new Master Plan for the Central Delaware. 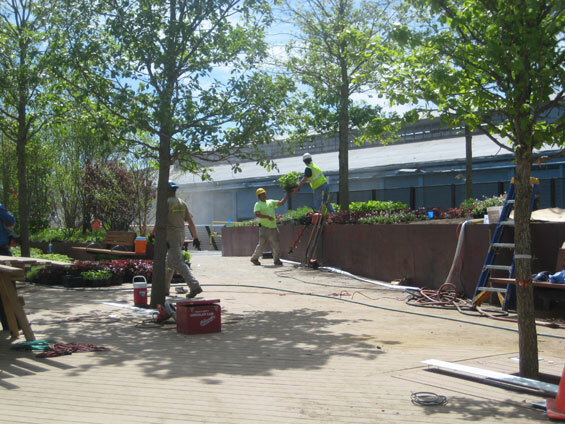 Funding for new park has been provided by The City of Philadelphia, The Commonwealth of Pennsylvania, The William Penn Foundation, The Pennsylvania Horticultural Society, The Pennsylvania Department of Environmental Protection (Coastal Zone Management) and a challenge grant from The Pew Charitable Trusts. Trees: The 37 large caliper Swamp White Oak (Quercus bicolor) trees are very special. They were cultivated for four years at a nursery in Millstone, N.J for the World Trade Center Memorial at Ground Zero in New York City. Grasses and Perennials: Almost 10,250 individual 4 inch pots of shade tolerant grasses and perennials were planted in weathered steel planters to increase diversity and add texture, color and seasonal interest. 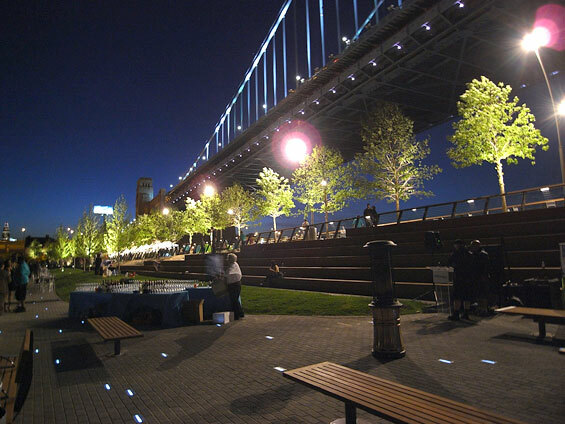 Lighting: The park’s setting under the Ben Franklin Bridge is spectacular at night; therefore the park was designed to be enjoyed in the evening as well as during the day with extensive lighting including 200 LED Solar Light Blocks embedded into the paving. 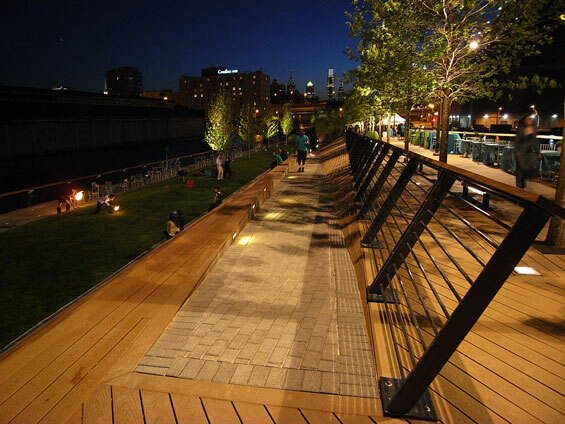 Paving: The paving on the upper level ramp is Trex, a sustainable synthetic decking material made out of reclaimed plastic and wood, representing one of the largest public installations of Trex decking in the country. 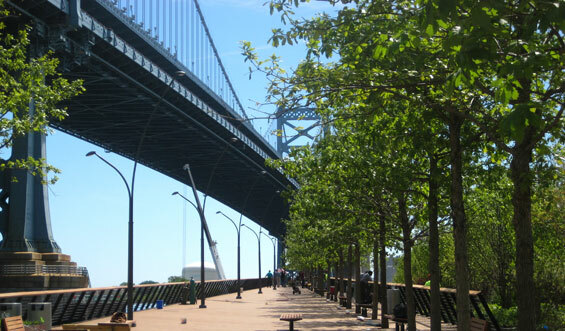 Railings: The perimeter railing leans at a 65 degree angle towards the pier, further accentuating the forced one-point perspective of the ramp rising along the Benjamin Franklin Bridge. Lights are incorporated into railing on the lower level. 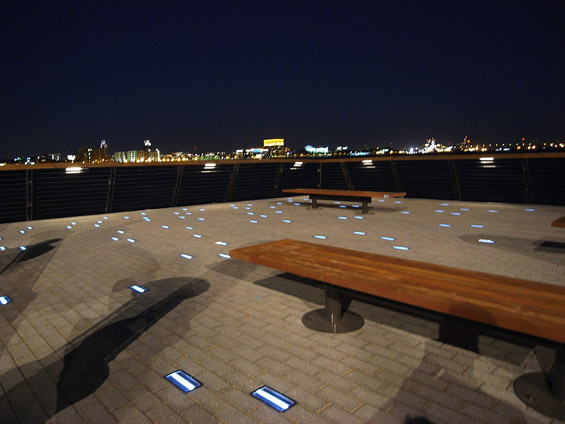 Seating Steps: Tiered seating terraces link the upper and lower levels and create a destination at the end of the pier for viewing, gathering, and contemplation. Wharf Drops: 2 wharf-drops on the lower level originally used to unload cargo for shipping were retrofitted and integrated into the new park. They are covered with transparent metal grating and a portion of one has been left open for users to experience the river in an unusual and authentic way. Fill: Over 2,000 cubic yards of geofoam fill was used to form the sky promenade on the upper level. Tides: The Delaware River is tidal, fluctuating an average of six feet in elevation a day. At mean high water level, the lower level of the pier will be approximately 4.5 feet above the river, making the Race Street Pier one of rare places where you can get close to the water. The Race Street Pier is also a tidal register, where you can find out the forecast for high and low tides for the City of Philadelphia. wow, really great peace of work… mind blowing.